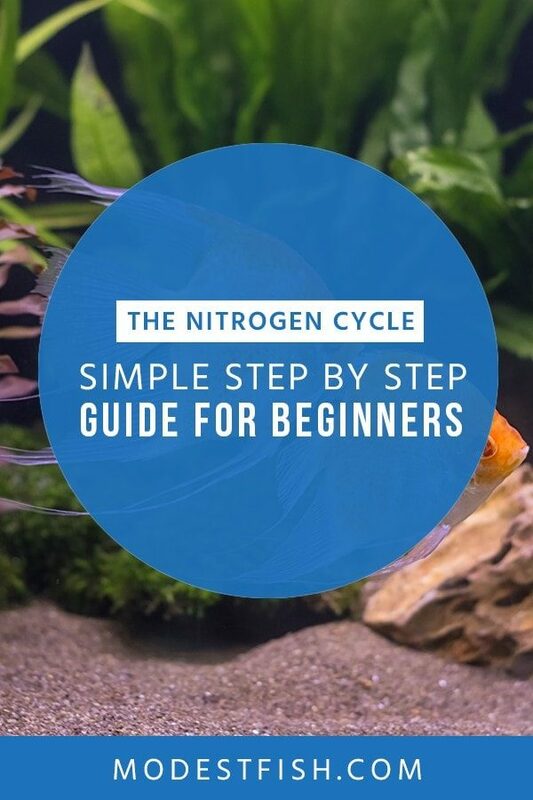 The Nitrogen Cycle is something you can’t avoid when owning your own aquarium. In this article, you’re going to learn exactly how to cycle your tank so you’re able to provide a happy and healthy environment for your aquatic pets. Click a button below to jump to that section. How Long Does the Nitrogen Cycle Take? You might have heard the terms Biological Cycle, Nitrification Process, or New Tank Syndrome being thrown around. But, they all refer to the same cycle – The Nitrogen Cycle. So what is it, and why is it so important? Would you like to be surrounded by your own pee and poo all day every day? Probably not, and neither do fish. Your fish’s waste releases ammonia into the water, which will kill your fish. Death by poo? No thank you. The Nitrogen Cycle helps avoid this. It’s a process where beneficial bacteria becomes established in your tank and filter media, allowing ammonia (toxic) to convert to nitrite (toxic), then nitrite to nitrates (non-toxic). That’s why it’s so important! The beneficial bacteria in your filter will supplement your fish’s environment by neutralizing their waste. However, if you allow the nitrate levels to get too high it can lead to a loss of color/appetite and will allow algae to bloom. That’s why water changes are necessary. Anywhere from 2 weeks to 2 months, depending on who you ask. Best answer is it will be finished when it’s finished. But you have to do it if you’re planning on keeping fish. And you’ll need to monitor the cycle every other day. Best way to do this is to purchase an aquarium test kit so you can check the ammonia, nitrites, nitrates, and pH levels. During this process, ammonia levels will rise and then drop as nitrite starts to take hold. Nitrate won’t appear until your tank has significant levels of nitrite. Once it hits the correct levels, nitrate will form and your nitrite levels will fall. When you can no longer detect nitrites, you can assume that it’s safe to add your fish. 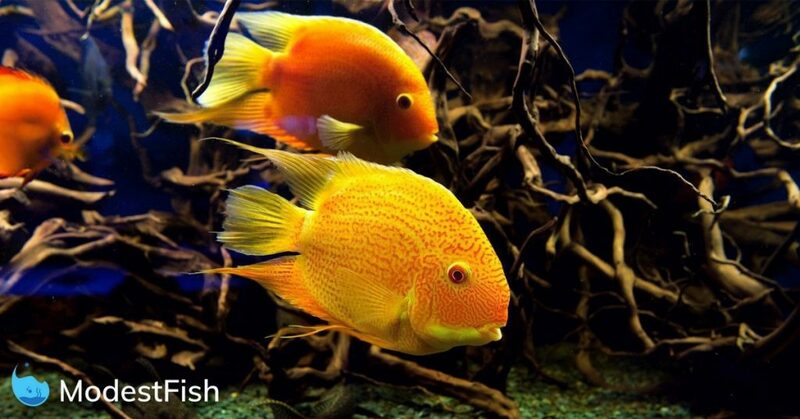 Introduced into your aquarium via fish waste or uneaten food, depending on the pH levels in your aquarium. Below 7, and it will produce ionized ammonium (NH4). Above 7, and you’ll get ammonia (NH3). Ammonia will continue to build up until the bacteria that eats it start to form. Your tank may become cloudy when this bacteria starts to form. When the ammonia levels spike and start to decline, you know you’re entering the second phase. The levels will rise as you see the ammonia declines. Nitrate is a byproduct of a bacteria called Nitrosomonas, this organism will oxidize the ammonia – turning it into nitrite. Essentially, this bacteria eats ammonia and produces nitrite, which is also highly toxic to your fish. Just like the first stage, you’ll have to build up the levels of nitrite until a colony of bacteria forms to dispose of them. You should see the nitrite levels start to rise at the end of the first week or during the second week. The final product of the Nitrogen Cycle. Once your nitrite levels have reached a certain point a bacteria called Nitrobacter will develop. They’ll convert the nitrites into nitrates. When the levels of nitrite and ammonia reach 0ppm (parts per million), your tank has been cycled. Now, that’s not to say you can sit back a relax. Nitrates aren’t toxic in low concentrations, but, if they reach above 20ppm (depending on the species), they’ll become toxic. So you’ll need to monitor the levels in your aquarium. There are two methods you can use to maintain acceptable levels. Perform regular partial water changes (20-50% every 1-4 weeks, depending on stock levels). This will also benefit your tank by removing substances such as DOCs (dissolved organic compounds), solid fish waste and replenish dissolved materials that your plants and animals may need. If you own a freshwater fish tank, you can add aquarium plants can help use up some of the nitrates. Own a saltwater tank? live rock and deep sand beds can have anaerobic areas where denitrifying bacteria can break down nitrates into harmless nitrogen gas. Enough Science! How do I Cycle my Fish Tank? Okay, okay, let’s get to it. How do you actually go about performing a Nitrogen Cycle? There two main methods you can use: Cycling with fish and cycling without fish. Let’s start with how you can cycle your tank with fish. Let me start by saying, this is not the preferred method. You’ll expose your fish to ammonia and nitrites during the process and a lot of fish won’t be able to make it through. You run the risk of stressing your fish, which can cause disease. However, some species can handle it better than others. And if you’ve made the mistake of buying your aquarium and fish on the same day, this may be your only option. Your aim is to populate the tank with fish that produce waste. But can also survive the high levels of ammonia and nitrite long enough to allow for the beneficial bacteria to grow. You should add approximatley 1-2 fish per 10 gallons of water. Adding too many fish will lead to excess waste. This can cause an ammonia spike and kill off your fish. 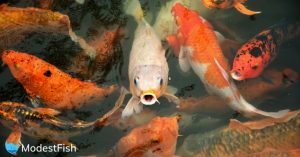 Feed your fish sparingly, be careful not to overfeed them. As a general rule of thumb feed your fish once every 2 days. And only provide them with moderate-sized meals. Because when fish eat more they’ll produce more waste. This increases the level of toxins in your tank before the good bacteria is able to colonize your aquarium. And you feed them smaller meals because leftover food will rot and produce even more toxins! Your fish are being exposed to potentially lethal amounts of ammonia and nitrate, so regular water changes are a must. It will help ensure the toxin levels don’t get too high. Aim to do 10-25% water changes every 2-3 days. Any more, and you’ll risk removing the ammonia and nitrite that beneficial bacteria needs to feed on. Make sure you add de-chlorinator to the water. Adding chlorine/chloramines will kill the bacteria and ruin the cycling process. You’ll need to purchase a test kit so you can monitor the ammonia and nitrite levels in your aquarium. Although it’s not essential to test for ammonia, it’s highly toxic. So keeping track of the amount in your tank will help you manage your fish throughout the process. Testing for nitrate is a must have. Like we discussed, at the beginning, there won’t be any nitrite in your tank, but after a few days, it will rise. Testing is important because you’ll need to know when the levels drop back down to zero – the signal to say the cycling process has finished. Testing every day is recommended, but, you can get away with testing every two or three days. Now that the toxin levels have reached zero in your aquarium, you can start adding more fish. You’ll need to do this gradually, only introducing one or two fish at a time. After each addition, wait for about a week and test the water again. If the ammonia and nitrite levels are still low, add some more. It’s super important to do this slowly. Adding too many fish will cause the ammonia and nitrite levels to rise. This will stress your fish and can lead to disease. This is the method I would recommend you use. And it’s very popular for one reason: it’s humane. I would like to add, there are other methods to doing a fishless cycle. However, it’s likely you’re a beginner, so I suggest using this simple technique. You’ll need to create an environment where ammonia is produced. You have no fish in the tank, so what do you do? A nice simple way to do this, is to begin by dropping a few flakes of fish food into your tank. Add the same amount you would if you were feeding fish. You can do this every 12 hours. Now, all you have to do is wait. The flakes will begin to decay – releasing ammonia into your tank. 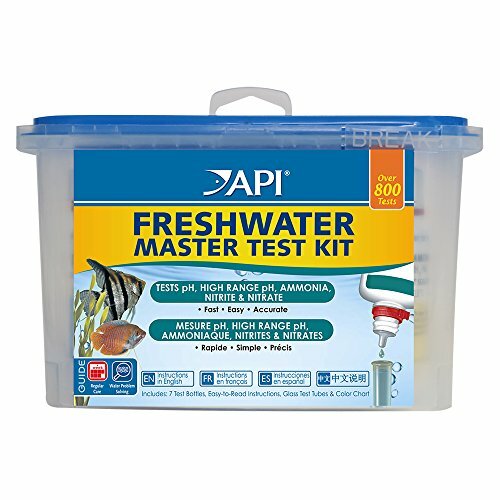 You’ll need a test kit and monitor the ammonia levels in your tank ever few days. And you’ll want the level to be at least 3ppm (parts per million). If there’s not enough ammonia in your tank, add more flakes and let them decay. Test every other day, and try and maintain the ammonia levels at 3ppm. Nitrosomonas will begin to grow and start consuming the ammonia. You should replenish them by adding more flakes whenever it drops below 3ppm. Once your week of ammonia has finished, it’s time you test for nitrites. You can use a commercial test kit for this. As soon as you detect nitrites in your tank, you’ll know the cycle has started. continue to add ammonia as you did before. After you’ve been testing for ammonia and nitrite for a few weeks, you’ll see the nitrite levels start to drop – now it’s time to start testing for nitrates. When this happens, it’s a sing the cycle is nearly completed. Once the ammonia and nitrite levels have returned to zero, the cycle is complete. However, if your nitrate reading is above 40, you’ll need to do some water changes to bring this number down. Now that you can’t detect any ammonia or nitrite, it’s safe to start adding your fish. Again, don;t just go adding a load of fish. You need to do this gradually. As mentioned above, don’t add more than a few fish at a time. And wait at least a week or two before introducing more. Consider cleaning any substrate with a siphon or hose before adding fish. It’s possible decaying food is trapped in there. If it’s trapped and you leave it, the ammonia won’t enter your tanks water, but if it’s disturbed, it could release a dose of unwanted ammonia rather quickly. I'm Impatient, Can I Speed up the Cycling Time? Yes, the nitrogen cycle can be sped up. If you don’t want to wait 6-8 weeks, you can use these techniques. You will need access to an established tank to use most of them. Filter media from an established tank will have nitrifying bacteria attached. You won’t have to wait for the bacteria to start growing naturally, so your tank will cycle quicker. Pro Tip: If you’re cycling with fish, it’s best to use filter media from a tank that’s a similar size, and has a similar number of fish. If you have access to an established tank which uses an undergravel filter, bacteria will be attached to the gravel. This will have the same effect as using media filter. Take roughly a cup of gravel and hang it in a mesh bag in your filter, if you can. If not, and you’re using an undergravel filter, lay it over the top of the gravel in your new tank. Attach your filter (the one you’ll be using on your new tank, duh) to an established tank, and let it run along with the existing filtration system. The bacteria from the ‘mature’ tank will colonize in your new filter. Let it run for about a week or so, and then move your now ‘seasoned’ filter to your new tank. Living plants, not fake plants, can help to introduce bacteria to help nudge the process along. Especially, if you get them from an established tank. And they won’t just bring the beneficial bacteria. Plants use a process called protein synthesis to moderate the ammonia levels in your tank. Pro Tip: Using fast-growing plants like Vallisneria and Hygrophila will help absorb more ammonia. This is important, a HUGE downside of using an established tank to speed up your Nitrogen Cycle is that you could transfer some nasty stuff. It’s possible it could contain unwanted pathogens like harmful bacteria and parasites. So be aware, never transfer anything from a tank that’s known to be contaminated with harmful organisms. It doesn’t matter what method you use, there’s no ‘magic pill’ or ‘silver bullet’ that’ll immediately cycle your tank. You can shorten the time. But, testing the water, performing water changes and regular maintenance is essential if you want to be a successful hobbyist. It’s always good to be prepared in case you run into any problems. Here are some common problems you may experience and how you can combat them. It’s important you deal with this quickly, or these symptoms can lead to death. To lower the ammonia levels, perform water changes more frequently – changing a greater portion of the water each time. Ammonia tends to start rising around day 3. If by day 5 you can’t measure any, and you’ve removed the possibility that you have a faulty test kit. Your tank may not be cycling. The most common reasons for this happen, is that there’s no source of ammonia or somethings eating it too fast for the bacteria to get to it. Try adding some more ammonia. If you have a lot of plants in the tank, try removing some of these and see if there’s a change. Test again after a few days, if there’s still no ammonia or nitrites, try adding more ammonia. Three main reasons this can happen: pH is too low, you’re using chlorinated water, or you’ve been cleaning too much. If the pH is under 7, ammonia will be mostly present as ammonium which the nitrifying bacteria can’t feed off. Use a pH kit to increase the level. Using chlorinated water will disinfect your tank – killing all the beneficial bacteria. So make sure you’re adding a de-chlorinator to the water before putting it in your tank. The bacteria you need lives in the gravel, filters, and decorations in your tank. If you clean them too much, you’ll remove the bacteria before is has a chance to establish. The reasons for this are similar to ammonia levels not dropping. If your Nitrate levels won’t budge from 0, it’s likely you’re killing them off before they get a chance to establish themselves. Again, make sure you’re not using chlorinated water or cleaning your tank to vigorously. Unfortunately, cycling your new aquarium can be an ideal environment for algae to grow. If you suffer from an algae bloom, try turning off your aquarium lights. If you’re using plants, you can’t just turn off your lights. So make sure your plants don’t get more than 10 hours of light a day. Avoid over-fertilising your tank and using a CO2 injector can also help. 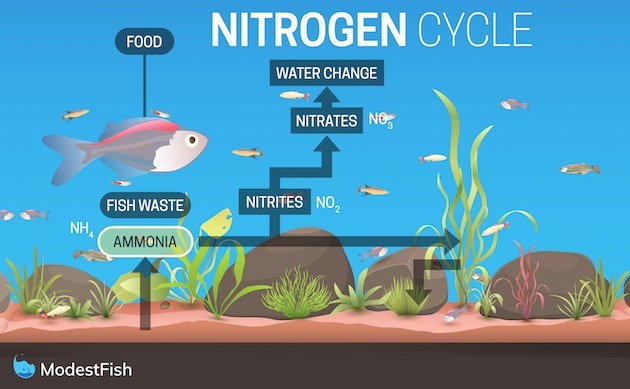 The Nitrogen Cycle is unavoidable, you have to do it if you want to keep healthy and happy fish. Try to remain patient, and keep and eye on the water chemistry. But, once you’ve cycled your tank and your ammonia and nitrite levels are 0. It doesn’t mean you’re home free. The Nitrogen Cycle never ends. The process establishes your tank, creating a balanced ecosystem. It repeats itself endlessly in your tank, so you should still regularly test the water and check for ammonia spikes. Omg i love you! Finally!!! A frigin sigh of relief for finding you!!! I have read AND UNDERSTOOD every si gle laymans english word you wrote here!! (bow to u..bow )… Im so tired of talking w fish people who look at me lime im stupid. Like GIMME A BREAK!! YOU WERE ONCE NEW TOO. Gosh whatever happened to humilty and grattitude for BEING INQUISITIVE and LOVING THIS HOBBY TOO? Thank you! As a creature liver myself of land ,air and water I am blessed to have the curiosity of knowing…researching and finding the people who ..like you…speak to me…who take the time to break it down enough to ACTUALLY CARE TO COMMUNICATE THOROUGHLY AND MINDFULLY. I am NOT a scientist or chemist in the least. Im more operatiinal from the right brain of artistic thoughts. So ive been doi g my best at understanding the Nitrogen Cycle and well…Repetition is the mother of skill! That combined wth so many other contributi g factors im starting to get the hang of this! Now time will tell if im able to reflect and example what ive learned here!😁. I just bought a 65 gal for my buddies that were growing too big for the 16 gallon. And i successfully transferred them tonight via the weeks help with cycling tank from the established 16 gal via filter media in external pump AND tank media …water..decor..plants…..there were just a couple thgs i did too fast compared to what you suggested here however there were more thgs i did correctly so THATS a plus! Now ive got to watch my numbers and do water changes until new tank is fully cycled! Im so tired but had to just say THANK YOU SO MUVH and i hope to stay in touch! Dianna! Dianna, I love your attitude! The goal of this site is to make it easy for anyone to start the hobby and provide proper care for their aquatic buddies, so I’m so happy you’ve found it useful. I wish you all the best, and please feel free to share your experiences with us. This hobby has so many variables (it’s part of the fun and frustration) it’s great to hear what works and doesn’t work for others. If you find anything we’ve suggested doesn’t work for you or you find better methods, please share, I might be able to update this post over time with more useful content. Happy fishkeeping. this is great, exactly what i was looking for. Please can you tell me when is best to add live plants, before or after the tank is cycled? Thank you for your comment, Emma. Live plants can actually help the Nitrogen cycle so you have the freedom to add them before or after. thanks so much for the advice. By the way, can i say a big thank you for your really well constructed information. I have read so much all over the web, but yours is the most easily digested. I am really excited to get my tank cycled and then populated, nothing fancy, just beautiful fish. I am keeping your page in favourites for quick reference! take care and thank you again! Thank you so much for your comment, Emma! Really happy you enjoyed the guide and I wish you all the best. Happy fish keeping! You are a rare writing talent. A complicated topic for non-insiders explained in a very magnetic article! Thank you veeeeery much. Thank you very much for your comment and support! I really appreciate it. Happy fish keeping! Thank you so much for your support, Debbie. 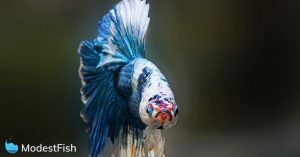 I’m very happy you have a better understanding after reading the blog :D. I wish you all the best and happy fish keeping! Thank you for your comment, Olaf. Most South American tanks will do fine with a stable pH range of 6.5 to 8.0. Now, when I say stable, I mean you keep it from changing too much. Also, when I say 7, it’s not a rule that’s 100%, more of a guide, target, or a potential fix to an issue. Some studies suggest it can occur with a pH as little as 4.0, however, when it comes to creating the Nitrogen cycle in the most efficient way, 7 is an ideal number to aim for. Hope this helps and let me know if you have any further questions. This was the best guide I’ve read on the subject – and I’ve read a lot the past few weeks! Recently set up my tank and will begin properly cycling it from tomorrow following your advice. I want to ensure everything is done meticulously to ensure the fish will have comfortable and healthy lives from the very beginning. Thanks for writing this.